Today when Ray and I went to the dogpark, we were late. Usually we get there around 9 a.m. and we know most of the dogs present, but today we didn't get there until about 10. There were only two people there with their dogs. One I recognized right away, a chocolate Lab named Rollo (after the candy) and his owner (who's name I don't know). Lately, Rollo is Ray's favorite playfellow when he goes to daycare. I guess it's because they know each other from the dogpark. Rollo's owner and I can't get them to play together when they are actually at the dogpark (Ray just wants to chase Rollo and yell at him as he chases a ball), but apparently, when Ray and Rollo are at daycare, it's a totally different story. 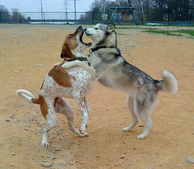 The other dog at the park was a Husky. He looked a bit familiar but I didn't think too much of it until Ray started to yell, then the Husky started to sing (Husky's don't bark, they just wrooo wrooo). The more Ray yelled, the louder the Husky sang. I got closer to his owner. "Is that Ray?" she asked. "It is," I replied recognizing the Husky's owner's accent. "Is that Bacci?" We used to see Bacci at the park all the time. He was one of the few dogs that Ray liked to play with. "Yes," replied Maria, "I thought that was Ray, but I wasn't sure until he started barking. We haven't seen him in a long time." "Does Bacci howl like that all the time?" I asked. "He howls," Maria said, "but not like that. He only does that when Ray is around." Maria had her cellphone out and was trying to get a video of Bacci's song. He was really going to town. Ray and Bacci started to play. Ray rarely plays with any of the dogs at the park. He is too busy doing what he was bred to do, chasing and yelling. The dogs were having a great time. I stood by dumbfounded as Bacci, being true to his name ('Kiss' in Italian) tried to get a bit, uh, romantic with Ray. Ray, who NEVER puts up with that kind of thing from ANY other dog, stood calmly by while Bacci licked Ray's ear and snuggled him. Then they were off, racing around and wrestling. Seeing my opportunity and thinking of the huge hole left by Murphy's move, I asked Maria if she lived anywhere near me and if she would be interested in bringing Bacci over for playdates. We swapped phone numbers and promised each other to be in touch. Oh my gosh! It's been so long! How've you been?